Food & Wine What do I need to know to master a stir fry? What do I need to know to master a stir fry? A stir-fry is a great way to whip up a quick and healthy meal. It is also adaptable, letting you use up bits and pieces from the fridge – any fresh vegetables that are hanging about, along with small quantities of meat, fish or legumes, and that little dab of sauce or salsa left over from dinner. Successful stir-frying is all about technique. Like sautéing, stir-frying means tossing small, even-sized pieces of food quickly in hot oil. This method, which cooks the ingredients but does not necessarily brown them, can be adapted for all kinds of fast cooking. 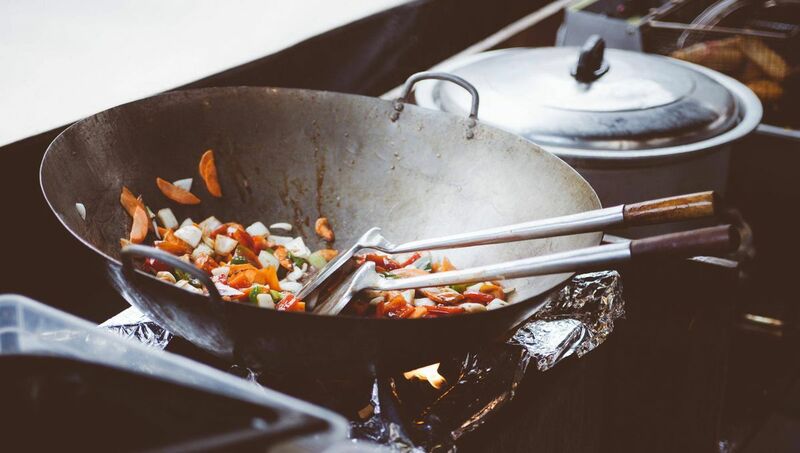 A wok is the preferred cooking vessel for stir-frying. Its round bottom and high sides mean that heat is evenly distributed, and food will not fly out when tossed. Carbon steel woks are more efficient than ones made of stainless steel, because stainless steel is not a porous metal, so food will stick in it. If you don't have a wok, use a heavy frying pan (cast iron is excellent), but not nonstick as it can't be heated high enough and sauces will not combine together properly. Organization is key to a successful stir-fry. Have all the meat and vegetables ready to go before starting to cook. They should be cut to the same size and shape for even cooking and eye appeal. If your protein is raw, a quick marinade with a little soy sauce, ginger, garlic or herbs and olive oil will add extra flavour. Always use the highest heat setting to cook quickly without burning. To help keep the food from sticking, heat the wok before adding any oil. To properly sear the proteins, the oil should be hot enough to smoke. Start by seasoning the oil with onions, garlic, ginger or spices to give lots of flavour. Cook only long enough to sizzle, about 30 seconds; you don't want them to burn. Remove the meat from the marinade and add it to the hot oil. Toss until the pinkness disappears. Remove and reserve so as not to overcook or crowd the wok. Next, stir-fry the vegetables, then return the meat and add the final seasoning sauce. This can be Asian (soy, ginger, oil, oyster sauce, sriracha), Spanish (peppers, tomatoes, smoked paprika, garlic, saffron), Italian (tomato sauce, basil, olive oil, grated Parmesan), French (wine, stock, herbs, a little butter) or invented by your imagination. Season well with salt and pepper and, to give it a more layered feeling, scatter over some herbs, nuts or seeds. Finish with a sprinkle of rice, balsamic or apple cider vinegar, which heightens flavour. Once you've gathered your ingredients, you'll have a mouthwatering meal on the table in 15 minutes. Easy peasy. Chef Matt DeMille has a recipe and technique to pull off a sous-vide steak, without the need for an intense immersion circulator machine or vacuum pack. What’s the best way to grill a steak in the winter? I just got a cast-iron frying pan. What do I do with it?